To save some work, I started with RaspberryPi-Buildroot which already has everything needed to build for the Raspberry Pi. This has been my starting point for several projects. Definitely a job well done. For a USB wireless adapter, I'm using this tiny little thing: Edimax EW-7811Un 150 Mbps Wireless 11n. So far, I have not had any power issues running completely off USB power without a hub and the connection seems rather stable. Be careful with other wireless adapters that require more power than the Raspberry itself can supply. Remember, the Raspberry uses power as a USB device and then reuses that power to be a USB host. By definition, it can't supply all the power necessary to be a solid USB host. 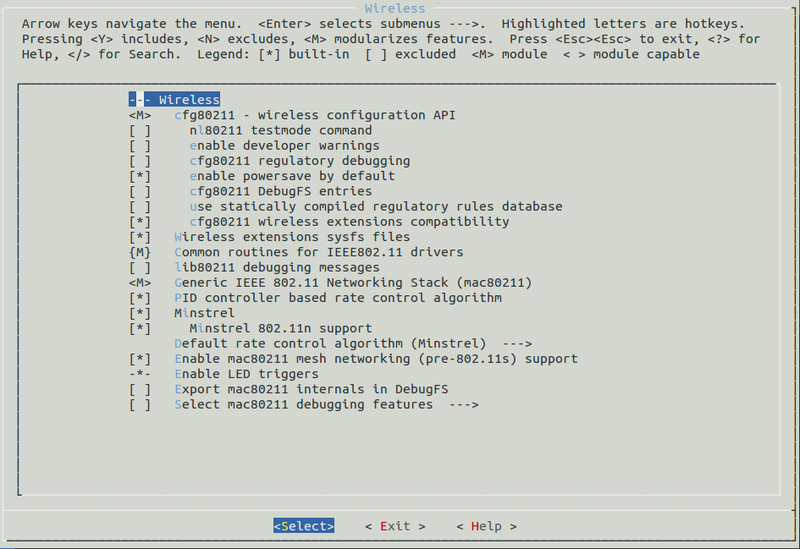 Assuming you already have basic networking working on the Raspberry, there are a couple more things you need to enable. 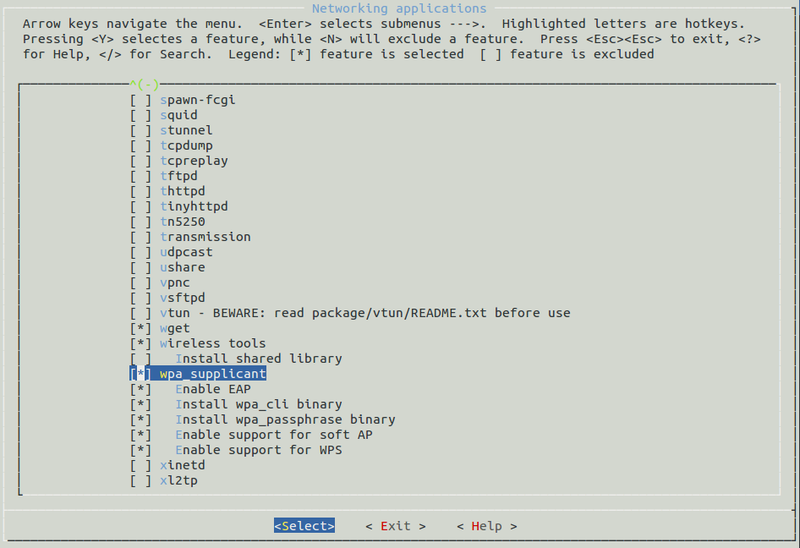 Enable wireless tools and wpa_supplicant in buildroot. 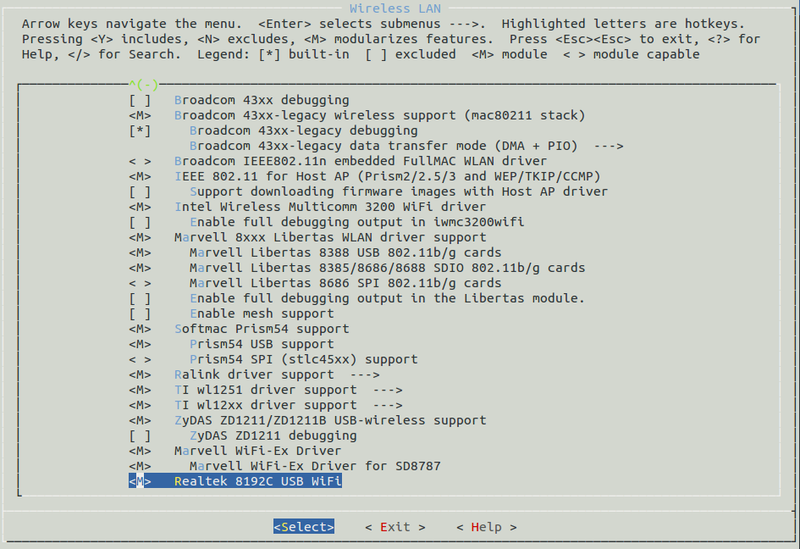 Also, you need to enable the necessary wireless support and drivers in the kernel. Beyond the basics, you need CONFIG_RTL8192CU=m for the wireless adapter mentioned. Here's my basic kernel wireless network configuration. Configure the wireless adapter driver. Now, for the necessary configuration to setup the wireless interface. Now, you can simply ifup to bring up the interface as necessary. A quick iwconfig reveals some of the properties. wlan0     IEEE 802.11bg  ESSID:"<ssid>"  Nickname:"<WIFI@REALTEK>"
This particular wireless adapter has a blue LED (hidden) that you can see flashing when it is in operation. Here is the Raspberry Pi in full wireless action mounted on a plate discussed in a previous post. Note that I'm using a transparent looking USB extension cable for the wireless adapter for easier access. what is it ? I am looking for a wireless usb plugs for my laptop . I had a problem on my laptop usb port. Can you help me please!